WASHINGTON -- An influential US senator warned Thursday of the repercussions on North Korea should US President Donald Trump go ahead with his plan to pull troops from Syria. Sen. Lindsey Graham (R-SC), often regarded an ally of Trump, said the president's decision to withdraw US forces must be reconsidered. "I don't know how this decision was made. It literally came out of left field. It has rattled the world," he said in a bipartisan news conference with Sens. Jack Reed and Bob Menendez. "You see North Korea flexing their muscle now: 'Why don't you leave South Korea before we do a deal?'" 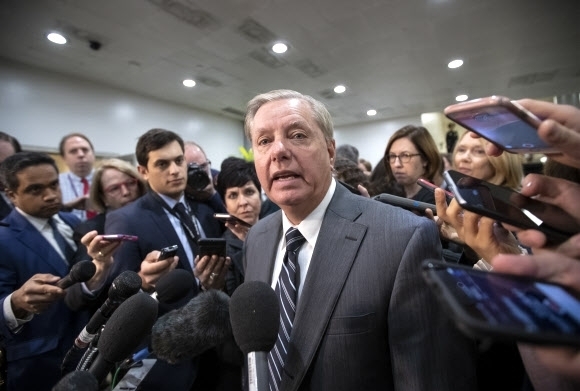 said Graham, a member of the Senate Armed Services Committee and a well-known skeptic of the North's commitment to dismantle its nuclear weapons program. The US stations some 28,000 troops in South Korea to deter North Korean aggression, a legacy of the 1950-53 Korean War that ended with an armistice, not a peace treaty. Trump and North Korean leader Kim Jong-un agreed at their summit in June to "work toward" complete denuclearization of the Korean Peninsula, but progress has stalled. In an apparent sign of its frustration at the impasse, Pyongyang's state news agency accused the US of misinterpreting the summit agreement as a commitment to denuclearize only the North. "When we refer to the Korean peninsula, they include both the area of the DPRK and the area of south Korea where aggression troops including the nuclear weapons of the US are deployed," the Korean Central News Agency said Thursday in an English dispatch, referring to the North by its formal name, the Democratic People's Republic of Korea.